LA MESA – At halftime of its Friday night game against St. Augustine, Helix celebrated the 40th anniversary of the Highlanders’ first CIF San Diego Section championship team of 1978. 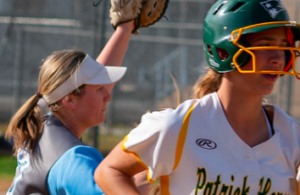 It was the first of four titles for former coach Jim Arnaiz, and the Scotties would capture five more banners for a total of nine in those 40 years, plus a state championship in 2011 and a state runner-up finish last year to Folsom. 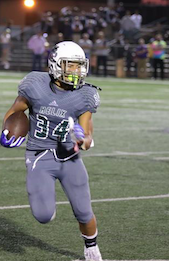 At halftime of its Friday night game against St. Augustine, Helix was losing by a touchdown and was in serious danger of starting this season 1-4 for only the second time in that 40-year span. Third-year coach Robbie Owens had seen enough. He lit into his team with a spirited halftime “talk” that seemed to trip a switch with the players. “I just told them we have to play with passion,” Owens said with a wry grin after the No. 8-ranked Highlanders scored 28 unanswered points after trailing 14-7 at halftime. “I just challenged them at halftime to play physical. They got it, completely dominating the game on both sides of the ball in the final 24 minutes. 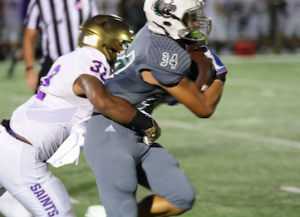 After gaining only 36 rushing yards in the first half, Helix relied primarily on running plays in the second half, rushing for 222 yards and three scores. The defense also pitched in with four interceptions, including a 45-yard Pick-6 return by Jaiden Brown. Junior tailback Elelyon “Fato” Noa rushed 25 times for 167 yards, including a 17-yard touchdown. Playing safety, he also had an interception in the fourth quarter. Traylor, platooning at quarterback with Daniel Amon, carried 12 times for 79 yards, including touchdown runs of 7 and 4 yards. Junior tailback Xavier Hamlett added 44 yards with his four attempts in the second half. 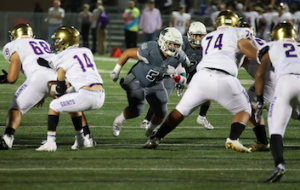 St. Augustine came into the game with three shutouts and had yielded only 10 points with a stellar run defense that had dominated its first four opponents. 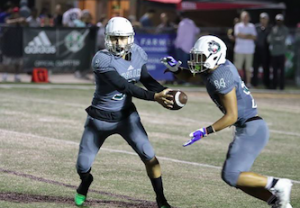 Running behind a line of Alex Nagy, Isaiah Jatta, Isaac Gonzalez, Nathan Adams and Christopher Alvarado, Helix scored on its second possession of the third quarter to tie the game 14-14 as Noa burst off right tackle to score on a nifty 17-yard run. 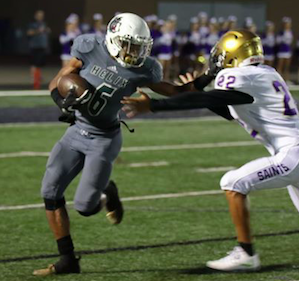 On their next possession, the Highlanders ran eight straight times for 65 yards with Traylor scoring on a 7-yard keeper to give Helix a 21-14 edge with 1:55 left in the third quarter. Three plays later, Brown stepped in front of a Saints pass for an interception that he returned 45 yards to give the Scotties a 28-14 lead with 0:58 to play in the third quarter. Traylor scored his sixth rushing TD of the season with a 4-yard keeper up the middle to cap a 10-play, 87-yard drive that was highlighted by a 52-yard gain by Noa. “Our No. 1 goal was to stop Noa,” Kremer said. “We did that pretty well in the first half (55 yards), but he killed us in the second half. They all did. St. Augustine got its longest gain of the night on its first play of the game when junior quarterback Angelo Peraza connected with tight end Michael Ambagtsheer for a 42-yard pass. Eight plays later, the Saints had a 7-0 lead when fullback Sage Eismann scored on a 2-yard plunge into the end zone, and kicker Brian McCorkle’s PAT attempt caromed off the helmet of a Helix player up and just barely over the upright. Helix responded immediately with an 80-yard, 13-play scoring drive to make it 7-7 with 2:21 to play in the first quarter. It almost didn’t happen, however. After getting a first down at the Saints’ 27-yard line, Noa rushed for 5 yards but then lost 2 yards before an incomplete pass on third down. The officials initially (and mistakenly) gave the ball to St. Augustine before finally realizing it was actually fourth down at the 24-yard line. Next play, Amon threw a perfect over-the-top pass to Chris Rivera, who grabbed it in stride in the back of the end zone. Traylor got the first of the Highlanders’ four interceptions on Saints next possession, but Helix had to punt three plays later. With a crisp attack, St. Augustine reeled off a 12-play, 74-yard scoring drive to make it 14-7 as sophomore tailback Byron Cardwell scored on a 3-yard run. Cardwell had 69 rushing yards in the first half and finished with 100 on 28 carries. Peraza was 11-of-27 passing for 140 yards with four interceptions. Ambagtsheer caught five passes for 97 yards. For Helix, Amon was 4-of-10 passing for 72 yards. He attempted only two passes in the second half, completing one for 8 yards. Traylor took most of the snaps in the second half but did not attempt a pass. Helix whipped St. Augustine, 35-7, last year en route to winning the section Open Division championship over Mission Hills, 26-19. The Highlanders then beat Oaks Christian in the state playoffs before falling to Folsom, 49-42, in the Division I State Bowl Game. 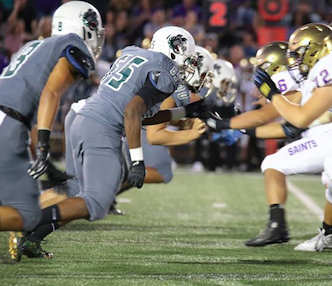 Helix has played in four consecutive Open Division section championship games, beating St. Augustine, 44-30, in 2015. Before losing to San Marcos in the Open Division first round last year, the Saints had played in five straight section title games in four different divisions from 2012-16. That was all under coach Richard Sanchez, who left after last year to become an assistant coach at San Diego State this fall. 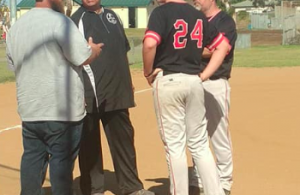 Kremer had been a coordinator at St. Augustine for seven seasons before taking over the head job in the spring. 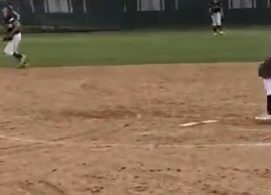 Helix has played the toughest schedule in the section to this point this summer, and Noa has missed 2½ games after sustaining a concussion in the first game, a 43-3 loss at San Bernardino Cajon (ranked No. 9 in the state). 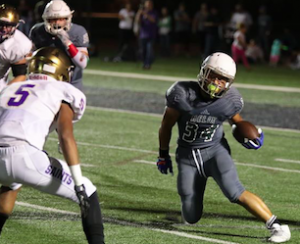 In Week 2, Helix beat Arroyo Grande, 34-3, then lost 28-21 to Scottsdale Saguaro (No. 4 in Arizona) and 30-21 to Cathedral Catholic (No. 29 in the state). The Highlanders, who have now won 14 straight home games, have a bye next week before opening up Grossmont Hills League play at El Capitan on Sept. 28.